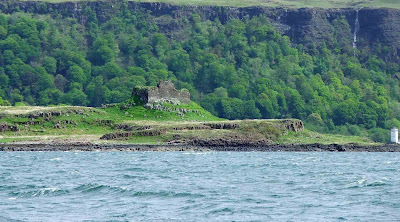 Dunollie castle is built on the headland at the entrance to Oban Bay. The remains consist of a tower house with a courtyard, and traces of a wall circling the summit of the headland. 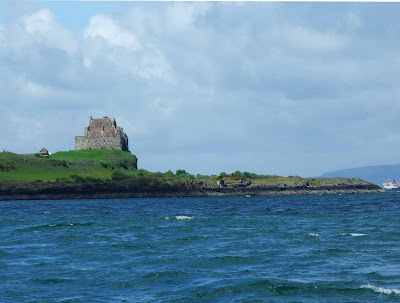 The castle was built in the 12th century, probably by Ewan MacDougall, however the surviving remains of the tower house date from the 15th century. The only remaining portion of the curtain wall, is around 15 feet wide and precariously perched atop the summit. 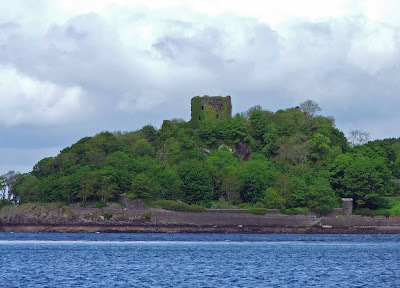 The castle is visible as you sail into Oban Bay, shrouded in trees and covered in ivy and creepers. 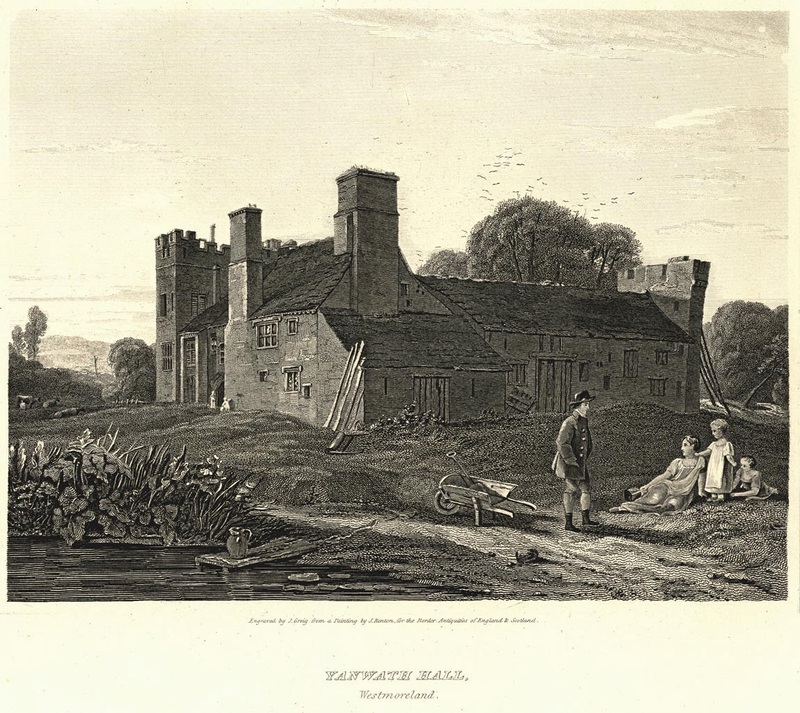 In 1746, the castle was abandoned by the MacDougalls, in favour of Dunollie House just down the road. 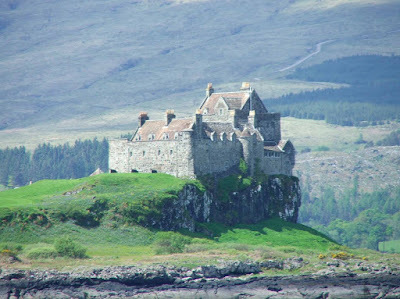 The castle of Duart sits on a headland overlooking Duart Bay in the Sound of Mull. The castle is most likely to have been built sometime in the 13th century, although it’s not been possible to date the buildings exactly. When the castle was acquired by the MacLeans in the 14th century, a rebuilding and extension period was undertaken, whereby buildings that were previously erected within the castle walls were demolished, and a substantial tower house was built. 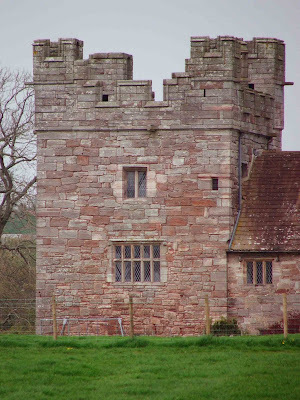 The curtain wall, the kitchen and a well are all that now remain of the original 13th century structure. Above. 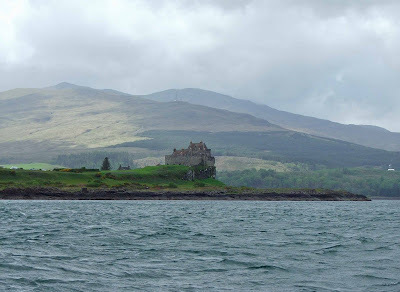 View of the castle looking North West, sailing towards the Sound of Mull. Further alterations were made in the 16th century, when more accommodation was added at the expense of buildings in the courtyard. Above. 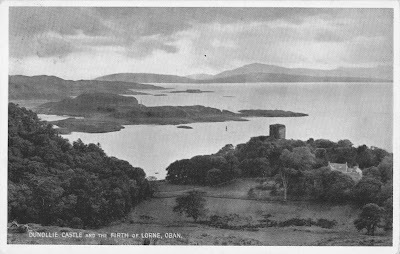 Another view of the castle looking North West, with Dun da Ghaoithe in the background. 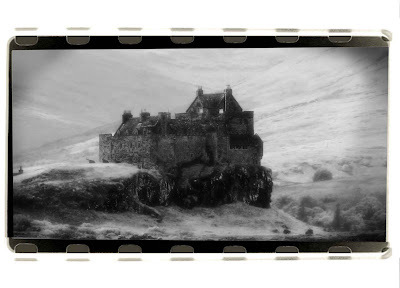 In 1674, the castle was bought by the Campbell Earls of Argyll, and was regularly garrisoned with troops. Soon after this time, the castle was beginning to deteriorate, and by 1748, the tower house was roof-less, and many other buildings ruinous. The castle was re-acquired by the MacLeans in 1911, and was partially rebuilt a year later. Ardtornish Castle was once the seat of the high chiefs of the Donald Clan, from the early 14th to late 15th century. 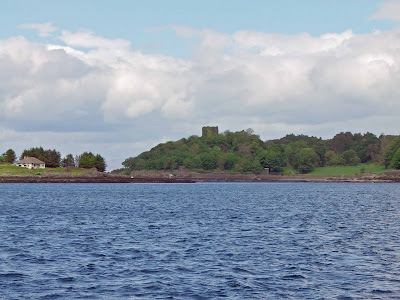 The castle is sited on a headland in the Sound of Mull, about a mile south east of the village of Lachaline. 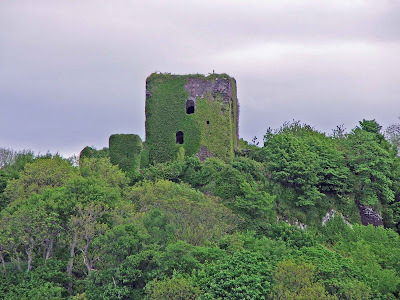 The castle was possibly built in the second half of the 13th century, and probably abandoned by the end of the 17th century. 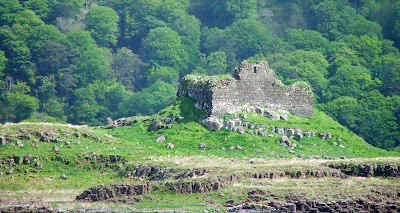 The main ruins that can be seen today, consist of the remains of the Hall house, rising around 32 feet above the sea below it. 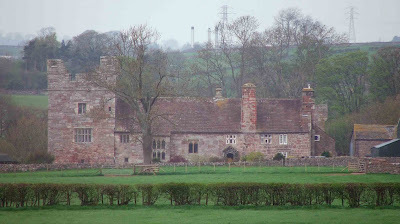 Traces of other buildings can still be seen on the North side of the hall. A small boat house has been identified, as has a kiln. There are no defensive earth works at the site, either on the sea ward or land ward side of the castle. It appears that the natural position of the castle was enough to ward off potential attackers.The castle was restored between 1910 and 1915, albeit badly, with much of the outer walls refaced. Many of the windows were altered or even blocked up, and many of the rooms that can still be seen are full of debris from collapsed walls and roofs. The surviving walls of the hall house are around 9 feet thick in places, and rise to around 16 feet at their highest points. 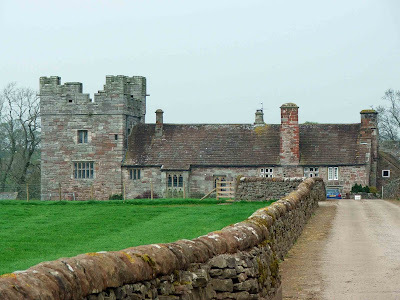 The hall house, shown in both photos here, measures around 55 by 30 feet, and is built upon a rocky outcrop, no doubt providing yet further stability and strength for this well placed castle. Access to Ardtornish was mainly by sea, and the beach is littered with tiny coves and inlets in which small boats could be moored. You are able to get to the castle's remains, but it involves a trek of some seven or eight miles. From Ardtornish village, there is a track that runs along the East shores of Loch Aline. As the headland of Ardtornish Point comes into view, you have to leave the track, and continue South for about three quarters of a mile. The castle lays directly in front of you. Mayburgh lays just off the B5230, the road that leads to Yanwath Hall. It is set back off the road about a hundred and fifty yards. The henge is visible from King Arthur’s Round Table, the entrance clearly discernable. The henge is a late Neolithic monument, with the earthworks surviving nearly intact. The encircling bank is nearly 7 metres high at its highest point, and surrounds a flat interior measuring around 90 metres in diameter. The bank is nearly 45 metres wide at its widest point. The bank is constructed of pebbles probably carried by hand from the nearby River Eamont. The single entrance is on the East side of the bank. There is a single standing stone in the centre of the remains, although there are suggestions that there may have been as many as eight at some time. It’s rather surprising that the henge has never been excavated. There is ample parking at the foot of the henge and it’s open all year round.